Easy Rack distribute the "classic" design of folding metal security gate that has stood the test of time for many decades as the most durable and dependable form of gate design. Our folding metal gates are made of 3/4" wide 14 gauge steel channel that is riveted back to back with solid steel rivets. Solid rivets provide the necessary strength to endure stress and last longer under adverse conditions. Gate rails are made from 1-1/2" x 1-1/2" x 1/8" thick hot rolled angle iron that resists abuse and last longer than thinner alternatives. Our drop pins are made of 5/8" round rod and all casters are steel. We thoroughly coat each metal security gate with black enamel paint. Metal security gates block access points and create restricted areas for security and safety reasons. 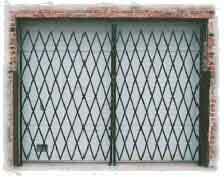 Made from a sturdy, impenetrable lattice of 14-guage channel steel, a metal security gate cannot be pushed through or broken down. Because the lattice consists of mostly empty space, however, it provides clear visibility for surveillance, and it helps ventilate fumes, metal by products, and excess heat from plants and warehouses. There are four basic types of metal security gates that Easy Rack currently provides: single gates, double gates, door gates, and portable gates. Single and Double gates mount on hinge pins that allow workers to pivot the gate to the side when the doorway must be opened to traffic. The center of the gate is strengthened by a drop pin that prevents it from caving in when pushed either from the center or the top. This design makes the unit both durable and vandal resistant. Protection from the elements and added durability also comes from a thick coat of black enamel paint applied to every gate at the time of manufacture. These gates are designed to limit access to normal sized doors in commercial and industrial buildings. . Easy Rack has sizes to fit all doors and will manufacture custom-sized gates on request. Metal door gates offer companies a versatile design that allows them to be mounted to lock on either the left or the right. Metal security door gates will mount on either the doorframe recess or the outer wall surrounding the doorframe. Either position will allow the gate to be folded and swung to the side when it is not in use. These gates are made from a single steel lattice and cover the entrance to any number of commercial building access points. Standard locking position is on the left side, but custom ordered right side locking gates can be requested through your Easy Rack representative. To prevent the gate from losing its center, single metal security gates feature a drop pin in the center which provides added stability in wider openings. Just as the name suggests, double gates are simply two steel lattices connecting together in the center. This allows both sides to be swung completely 180 degrees to one side if necessary. These are ideal metal security gates to use in front of entrances that have heavy vehicle traffic, such as fork trucks, pallet trucks, pickups, and vans. These gates are ideal for construction sites. They provide movable security, and when they are folded up they are only 6.5’ high…small enough to fit through a standard door opening, and compact enough to be stored out of site. Portable security gates are easy to install and lock to the wall with a sample padlock hasp arrangement that comes included in your order. Easy Rack stocks a vast inventory of commercial shelving, material handling equipment, used pallet racks, and modular prefab buildings installed nationwide. If you can not find what you are looking for call us toll free at 1-888-776-3720 and we will find it for you. Our home office is located in Houston, Texas with warehouses located throughout the United States that enable us to service all 50 states including Memphis, Tennessee, Baltimore, Maryland, Charlotte, N.C, Milwaukee, Wisconsin, Seattle, Washington, Boston, Massachusetts, Denver, Colorado, Louisville-Jefferson County, Kentucky, Irving, Texas, Amarillo, TX, Dallas, TX, Brownsville, Texas, Grand Prairie, TX, Pasadena, Texas, Fort Worth, Texas., El Paso, Texas, New York NY, Miami Fl, Los Angeles, CA, San Diego, CA, San Francisco, Ca, Phoenix, AZ, Boston, MA, Chicago, IL .